Office coffee machines aren’t all that dissimilar to watering holes on the savannah: almost everyone makes a pilgrimage and the quality can vary wildly. Providing great office coffee service has been proven to improve the productivity of employees. Much like the lions and zebras with water, employees can be more effective and efficient with high-quality coffee service. That’s why we, at JavaWorks, offer our clients a bevy of options. From the best commercial coffee machines to coffee delivery, there are no lengths we won’t go to ensure your office is humming on the power of great coffee. In our previous two posts, we have gotten into the nitty-gritty of how to make that high octane cup of joe. We discussed wetting, extraction, hydrolysis, bed depth and brew time. As it turns out, using office coffee machines to produce fantastic coffee takes a few insider tips. In this article, we will get even deeper into the sophisticated world of the perfect brew. So if you’ve ever wished you could make the perfect cup every time, read on. Optimum balance is what delivers that “everything is the world is fine now that I have this coffee” cup. Coffee is to adults what slurp juice is to kids. We, at JavaWorks, understand the importance of coffee service, breakroom supplies, even simple snacks. We love coffee and love providing the best possible coffee service possible. 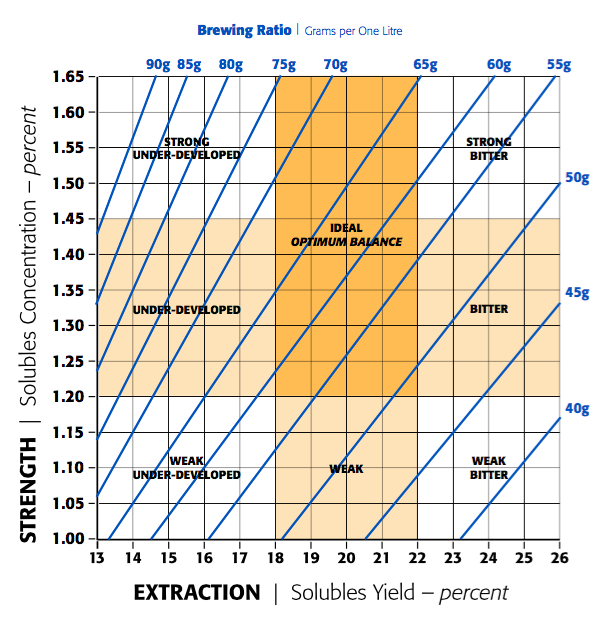 As we briefly touched on in our last post, there is a method to the madness of brew ratios. Brew ratios are simply the ratio between dry coffee grounds and water. Sounds simple enough but you also have to factor in the amount of time the water is in contact with the grounds, as well as the grind size of the coffee. Another critical factor is the strength of the coffee. The ideal amount of coffee material to end up in your cup is 1.15% to 1.35%. However, naturally, some coffees are stronger than that. The idea is to perfectly match the weight of coffee in your basket, the volume of water used and the strength of your coffee. For example, if you have coffee rated at 1.25 solubles concentrate, you’d use roughly 50 grams of coffee per half gallon of water. This graph supposes a half gallon of water used. In terms of the whole brew, between a third and a fourth will easily dissolve. Other soluble parts of the bean don’t dissolve during regular brewing. The ideal dissolve rate for the entire brew is between 18% to 22%. Optimum balance is what delivers that “everything is the world is fine now that I have this coffee” cup. This is also known as the “Golden Cup” by the Speciality Coffee Association of America. If you’ve got a brew strength meter, hydrometer, or refractometer handy, you’ll be able to measure it precisely. If you don’t because you are a normal human, don’t sweat it; we have that covered. Coffee is to adults what slurp juice is to kids. (Ask your kids; they’ll be very impressed.) It gives you that boost when the inevitable after lunch energy slack hits. It’s also that first delicious taste of liquid happiness. Whether your office coffee is delivered via office coffee machines, coffee delivery or even commercial coffee machines, it’s the goods that keep a workplace productive. We, at JavaWorks, understand the importance of coffee service, breakroom supplies, even simple snacks. We love coffee and love providing the best possible coffee service possible. Check out our website for more information.